John Brown’s Truth, a musical which integrates Afro-Caribbean, jazz, European classical, spoken-word, and dance—with words and musical conception by William Crossman—is a radical departure from traditional musicals and, as such, is truly a musical for the 21st Century. Its most radical feature is that, while its words are written, its musical score is not. All music—including that performed by the principals, the chorus, and the orchestra—is entirely improvised on the spot. This means that each performance of the musical is musically unique, newly recreated “in the moment.” The musical is also multi-modal using projected images and other technologies, and interactive involving some opportunities for the audience to briefly participate musically. The musical covers selected events, all within the year 1859, in the life of anti-slavery abolitionist John Brown as he prepares and carries out his raid on the federal armory at Harper’s Ferry, Virginia and, afterwards, as he is put on trial for the raid. Though the timeline of events depicted is historically accurate, the words is a mostly fictionalized rendering of conversations John Brown might have had—and in some cases actually did have, according to historical reports—expressing his actual beliefs, intentions, and plans. The musical is receiving its first performances on the 150th anniversary of the very events it is depicting. The musical has 2 Acts, each with 3 scenes. It can be presented in approximately 60–75 minutes. As written and conceived, it can be performed with a minimal cast of 5 singers, 5 musicians, one or more dancers, and 2–3 children performers ages 7–11—or with a much larger cast. There is one major principal singing role (John Brown) and one minor principal singing role (Preacher); the other singers comprise the chorus. The musical conception includes having a different singer step into the John Brown role at the start of each new scene, with the previous John Brown singer returning to the chorus. The conception also envisions diverse singers performing the John Brown role within each performance, including female and male singers of different ethnic backgrounds. 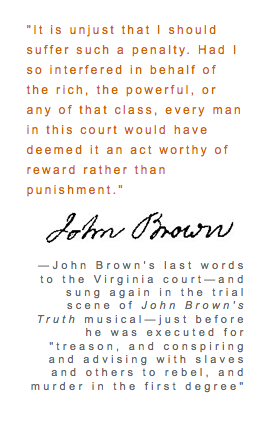 John Brown’s Truth can be performed by other groups with permission of the composer, William Crossman. Standard BMI royalty arrangement applies.